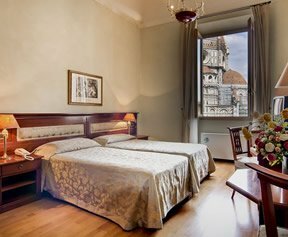 The fantastic location of the Hotel Bigallo makes it one of the finest choices of 3 Star accommodation in the fabulous city of Florence. 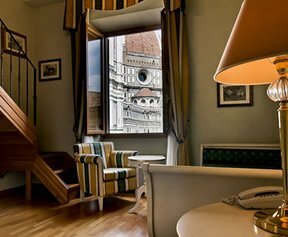 With most of our guestrooms overlooking the awesome Duomo, a more central location cannot be asked of a hotel in Florence. City Tours of Florence may be arranged via the front desk. Check our Interactive Map of Florence featuring satellite photo option and route planner, giving you a clear idea of this Florence 3 Star accommodation’s excellent location in the historical centre of this marvellous renaissance city. Il Duomo di Firenze crowns the beautiful cathedral of Santa Maria del Fiore, the focal point and symbol of the city of Firenze, it is defined by its characteristic orange dome which forms an unmistakeable part of the Florentine skyline. The masterpiece of the architect and sculptor Brunelleschi, il Duomo was begun in 1420 and took 16 years to complete. Just opposite the cathedral is the Baptistery which is believed to predate the cathedral, possibly to Roman times. This features another jewel in the Florentine crown in the ornate bronze doors by Lorenzo Ghiberti, which were christened by Michelangelo "The Gates of Paradise". 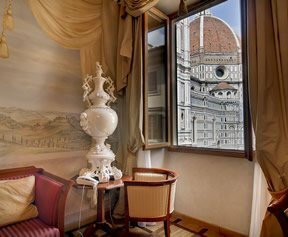 Within easy walking distance of the Florence Hotel Bigallo one will also find such national treasures as the Uffizi Gallery, Piazza della Signoria and Ponte Vecchio, as well as many fascinating artisan boutiques, designer shops and classical Florentine restaurants and trattorias – simply ask our Concierge for informed advice and bookings. Regular transport links run from Florence International Airport (Amerigo Vespucci) to Santa Maria Novella Train Station – the city’s primary Railway Terminal. From the station take Via Panzani followed by Via de’ Cerretani to Piazza del Duomo. From the main piazza take Via Calzaioli and take the first right into Vicolo degli Adimari, the Hotel Bigallo Florence is number 2. A taxi from the airport costs €22 + €1 for each luggage, though it is advisable to establish the price before departing.